In 2013, I partnered with Fresh Artists to start the Palates to Palettes program. 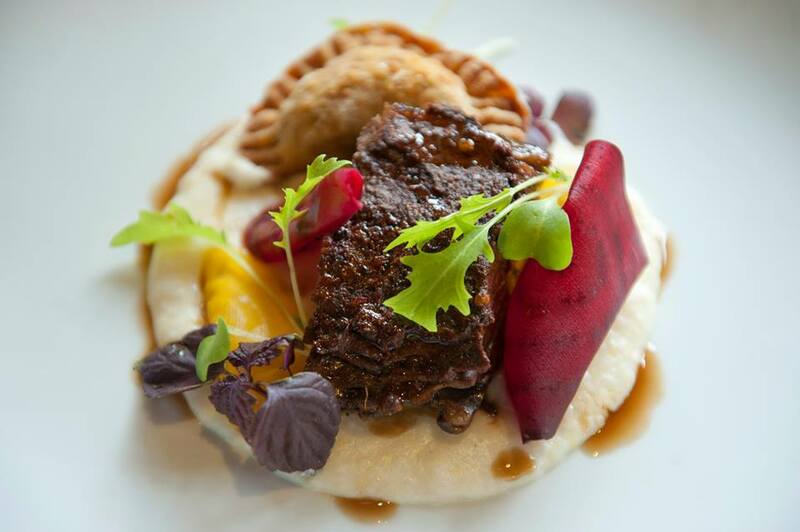 This project allows students from disadvantaged neighborhoods to experience both fine art and culinary art first hand. Fresh Artists joined forces with my art classroom at the Southwest Leadership Academy Charter School (SLA) and local participating restaurants to design a ground-breaking program to introduce kids to the art of culinary masterpieces – both on canvas and on the plate. This unique program attracted the eager participation of some of the top culinary masters in Philadelphia. Osteria chef Jeff Michaud, Bistro La Minette chef Peter Woolsey, Will BYOB chef Chris Kearse, and Sbraga chef Kevin Sbraga opened their top-rated restaurants to a select group of boys and girls from SLA under my direction. From my own experience as a server, I learned the art of efficiency from working with top local chefs at Zahav and Pub and Kitchen. I applied the design and management of a professional kitchen into creating a dynamic art classroom environment that inspires creativity and focus in my students. I took this idea a step further and collaborated with award-winning Philadelphia nonprofit, Fresh Artists, on the development of a highly innovative four-month pilot program - Fresh Artists Palates to Palettes program. 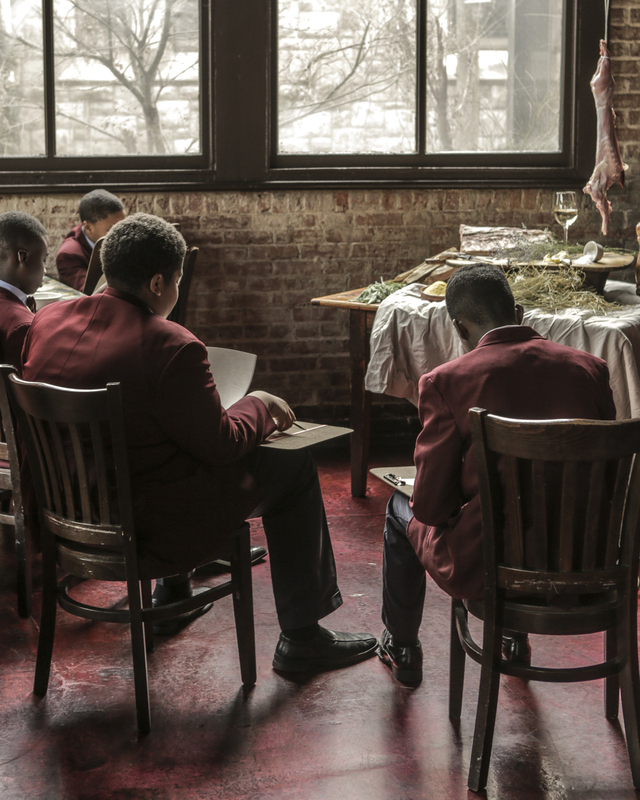 This multifaceted curriculum exposes middle school students to masterpieces in fine art and fine cuisine while introducing them to a variety of career paths in the creative economy. I began by teaching my students about the art of the still life. Beginning with a trip to the Barnes Foundation, we studied food-themed still lifes within their collection. We then visited four world-class restaurants in Philadelphia. At each restaurant, students met and interviewed the chef and discussed the design and concept of his restaurant. 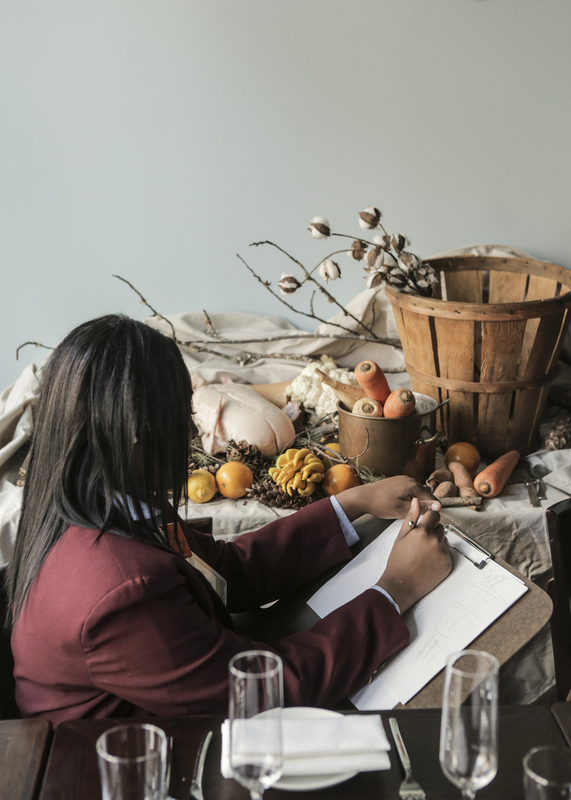 The students, as guests of the chef, were served the chef’s signature dish for lunch, then sketched a stylized tableau of the meal in preparation for their final artwork project. 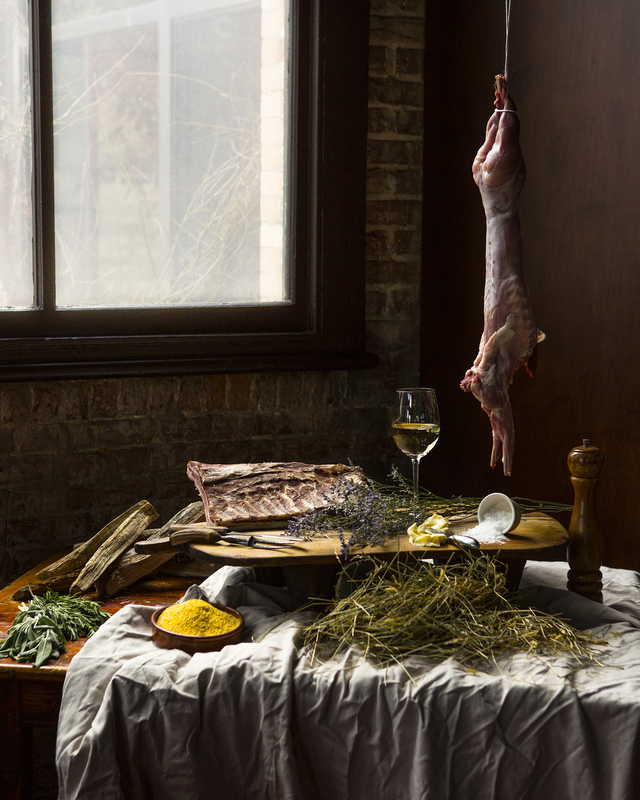 Osteria still life created by Mike Persico. Teaching students how to break down a still life into basic shapes. Students figure drawing live for the first time. Renowned photographers Michael Persico and Susan Beard styled and photographed the menu tableau and documented our restaurant experience. Fresh Artists provided large photographs of the still lifes for the student’s classroom use. Returning to my art classroom, they worked on their still life projects over a twelve-week period, interpreting the masterpiece meals in acrylic, oil pastel and collage. A final exhibition of their artwork was held at Le Bec Fin, where the "Chef's Choice" winner was selected. 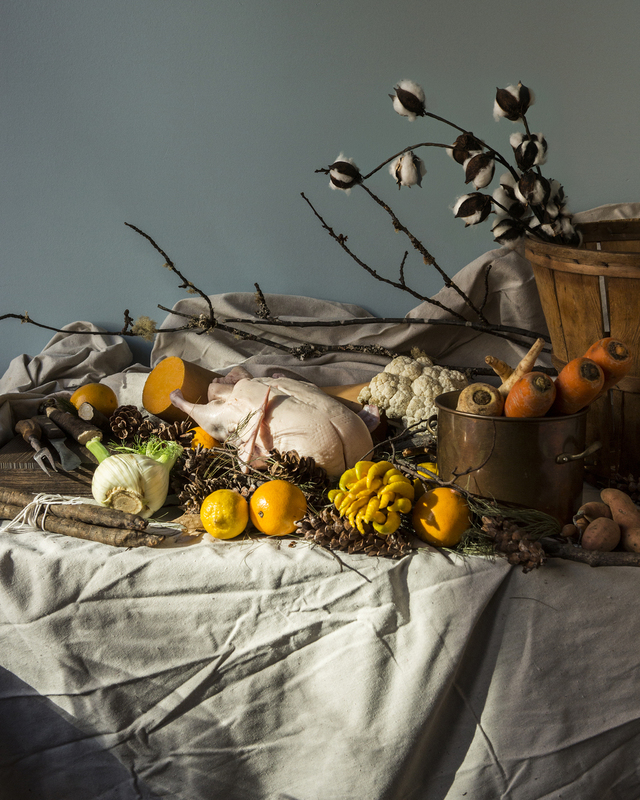 "Chef's Choice" winner, Lynus Aubee, interpretation of Osteria still life. The final still lifes were judged by the chefs and four students were selected to attend a dinner in their honor cooked by Zahav chef Michael Solomonov and hosted at Audrey Claire's COOK. Michael Solomonov explaining salatim and hummus to the "Chef's Choice" winners. The results are fantastic, beautiful, and astounding. Fresh Palates to Palettes plans to reoccur every year and hopes to grow, perhaps expanding and acting as a blue print for other cities and schools. My goal is a cookbook/ art book featuring all the recipes of the Chef's signature dishes and the artwork students created from them.